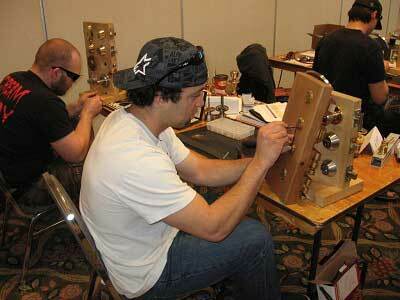 An ever-growing industry, locksmithing is a noble career path that many attempt to cultivate. The prospects of becoming a locksmith are intriguing and rewarding. Locksmiths get to help people every day, much like firefighters or clinical therapists. As if this altruistic incentive wasn’t enough, locksmiths also get the opportunity to work with police on investigations and can even be the first to find dead bodies under certain circumstances. There are even worldwide events hosted to celebrate and enjoy the art of locksmithing, with lockpicking competitions and the like. With the opportunity to make roughly $40 thousand a year with no need for a college degree, the locksmith career has a lot to offer. So, how does one get into the locksmithing business? Though the only requirement for an entry-level locksmith position is a high school diploma, there are certain educational standards that can help with the entire career. Taking math and mechanics-oriented classes during high school is a big plus because it indicates a preexisting familiarity with the technology. Some colleges actually offer locksmithing as a degree, which could only benefit someone entering the field. Of course, certification always helps. Locksmithing is a profession that has been built on the tradition of apprenticeships. This process is a key requirement for any aspiring locksmith. Before apprenticing, however, it is often recommended that you acquire some fundamental skills through a training program. Many technical schools offer locksmithing courses, and there are a plethora of online alternatives with access to video tutorials as well as consistent support. These classes offer everything from introductory sections to differentiating between types of locks to dealing with frightened clients. Of course, they teach lockpicking as well. These skills will enable you to take the certification exam and pass with flying colors, which automatically makes you a more reputable locksmith. Basic fundamental skills can decrease the apprenticeship time constraints and enable you to be more proficient in your prospective career. The actual on-the-job training is arguably the most important, because this is the part of the process wherein you are vetted on a personal level. No longer are you just being tasked with acquiring skills. Now, you must prove that you are worthy to belong in this noble profession. Because locksmiths are often in such precarious positions with access to people’s private property, it is critical that a locksmith be honorable and reputable.